Saindavi is one of the upcoming artists in the field of Carnatic Music (Indian classical music-south Indian style) as well as FILM MUSIC today.As a playback singer has sung songs in Tamil films, serials and albums. She has been performing from the age of 12. She is one of the youngest singer who excels in both, classical and light forms. Vinaya having been gifted with a divine voice and the art of singing. She excels in Carnatic classical as well as Film Music.Performed bharatanatyam at SAF-games. Saindhavi is engaged to G. V. Prakash, music composer and the nephew of A. R. Rahman . They studied together in Chettinad Vidyashram. Saindavi has been performing from the age of 12.Today she is the youngest singer who excels in both, classical and light forms. From a very early age she discovered her passion for music and had her tutelage from Mrs. Subbalakshmi Muthuswamy. Vinaya started her musical journey from the age of 9. She has been learning Carnatic Classical Music- Vocal for the past 18 years She has been trained in Bharathanatyam for 5 yrs from Udupi Shri Lakshminarayana. Her very first program on stage was with Shri Haridasgiri Swamigal (at the age of 13) after which she performed in various temples and sabhas. Has sung in more than 100 albums of different categories like spiritual, devotional, fusion, World Music etc. Saindavi is the recipient of the prestigious National CCRT Scholarship for Carnatic vocal from the Indian Government. She has won the appreciation from many connoisseurs and critics. 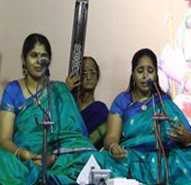 Vinaya participated and won in all leading music programmes conducted by various South Indian channels.